We all have them….chains from our past that bury us and define us. Chains such as anger, bitterness, fear, abandonment, abuse, betrayal, neglect, bullying, etc. Most of these issues surround the subject of trust and the lack thereof. We have all been hurt by someone, whether it was our parents, siblings, spouses, children, extended family members, love interests. coworkers, people in authority over us and so forth. Some have betrayed us and left us weaker than before we met them. Some walked away and abandoned us, so we were left standing in confusion and devastation. Now, for decades we have lived with the effects of that hurt and may have defined ourselves as unloveable, a loser, unworthy of a healthy marriage, unable to move up the corporate ladder, and generally feel like we are on the outside looking in. We may not even know who we are aside from all the chains! No matter how you are feeling about yourself right now, God knows you, He made you, He sees you and He does not define you by your past. He loves you for exactly as you are. If you just sat there and breathed, He would love you just the same. “God is not a God of shame, guilt, remorse, or regret. He is a God of love, acceptance, justice and grace. You may have heard the saying ‘God loves you and has a wonderful plan for your life’…a life not defined by the divorce of your parents, your divorce or the other things you have endured. You may barely remember when times were good or you may have many good memories to hang onto. Those will always be a part of you, however, they don’t have to define you. Talk to Him about how you feel and what hurts. Ask Him to help you believe in who He made you to be. Now, let Him guide you as you put feet to those prayers. Break the chains and build new ones grounded on the truth of the Word of God! 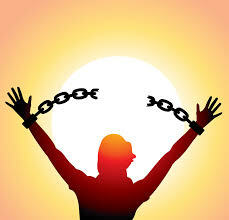 It’s YOUR life and you deserve to be free!